The Itty Bitty Kitty Committee: Put Some Kitty Bling on Your Blog! Put Some Kitty Bling on Your Blog! I've been meaning to do this for AGES and finally, I've got some IBKC badges to share with you. Look above and to the right and you'll see the IBKC Badge page. If you visit the page, you can grab the code, and paste it on your blog. There are four styles to choose from and they feature Pearla Dearborn, Clovis Ashby, Thurston Easterbrook, and of course, Charlene Butterbean! Thanks for helping spread the IBKC word!! added sweet Pearla to my blog. thanks for these. I have added sweet Pearla as well, love these! Added Pearla to my blog, do love Charlene too. AAAAhhhhh my beloved favorite pic of my beloved favorite PEARLA! That has to go down as the cutest kitten photo ever taken. Anyone I have ever shown it to has melted into a puddle of goo. Why oh why do I live in Canada and not Tacoma. I can't wait to see who adopots our precious Pearla. And it goes without saying that the Bean stands in a class all by herself. There is no equal to that lovely tender hearted princess. The GeraldBean video was priceless. Love these!! 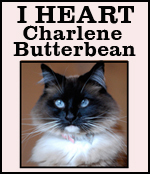 Added Charlene to my blog. Just as I was scrolling down and Thurston's picture appeared, the song "Billie Jean" came on the radio! Too funny!! Any updates on our sweet Easterbrooks? Gonna have to go with Thurston and his awesome dance moves!! Thank you for making these! I just noticed the TM for the first time. Fancy pants! I am definitely putting one of these on my blog but how am I supposed to choose which one?? Such cuteness! !